Chances are you have many things you no longer need. They’re cramping your closet space, overflowing from drawers and bins, and collecting dust in the corner. These are the very things that others in the community probably need and may not be able to afford. We’ve made it easy for you to pass those items on to others, helping to improve their lives. *We reserve the right to refuse any donations that we determine are not acceptable. Donation pick-ups are scheduled on a first-come, first-serve basis and we are often scheduled several days or weeks in advance. 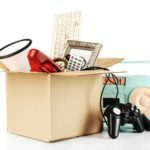 We no longer pick up furniture items – They must be dropped off. We only pick up donations within the City of London boundaries.